“In the daylight we could see quite dramatic cliffs behind us and a little village close to tents. The usual crowd of spectators gathered (some on bicycles) to watch the morning ritual. 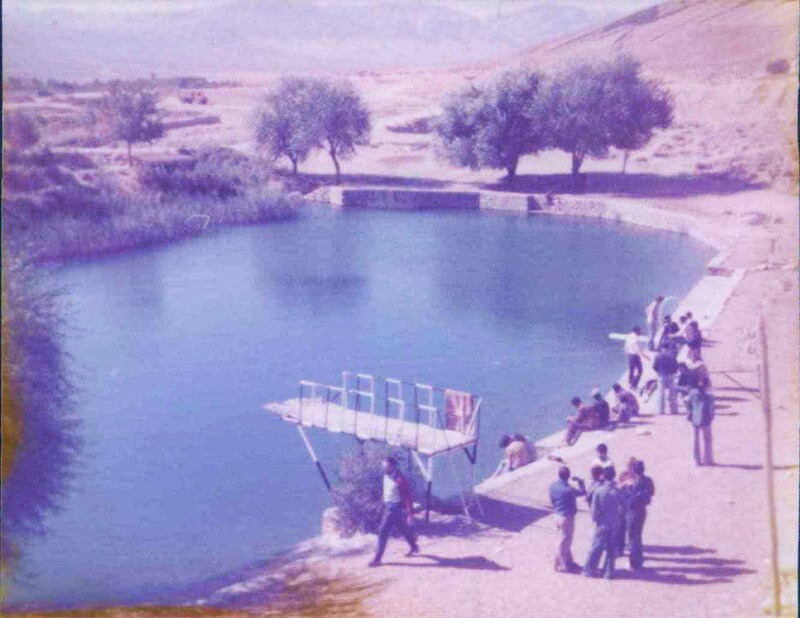 First stop was at a fabulous swimming pool, made from a fresh spring – beautifully blue and clear with trees round it. Six of us decided to brave the cold water – me, Nikki, Chris, Mark, Rob and Diane. Cold at first, but stayed in quite a bit because so refreshing. Then sat around in the sun. Talked about Rose Street [in Edinburgh, famous for its pubs] Diane had worked for 6 months at the Tankard Lounge (Paddie’s Bar). Next stop was in a little town – kids swarmed around bus – could hardly get away. Mary [a very independent New Zealander] got left behind! Apparently there’s always hassle there. Had sandwiches (butties) outside town. mounds of earth with deep shaft in the middle. Scenery becoming more and more barren and dry. Tried to shop in Neyriz but couldn’t even find any bread – must close down for siesta time. Great view over a lake; mountains spectacular too – sheer rock faces and jagged peaks. On other side, road riddled with channels and some under pools of water. Got stuck in one channel! Back of bus wedged into bank – all got out and pushed. Came across group of people sitting by side of the road – women swathed in black – obviously a bus stop! 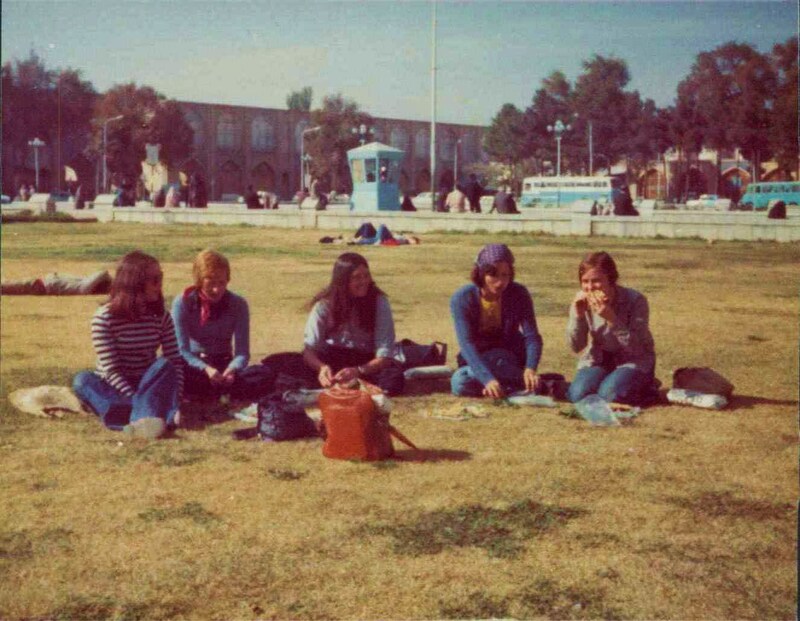 “After a cold shower and sweeping out of dusty bus, went into Esfahan for couple of hours. Went to bank in Bazaar again – no cay this time! Wandered round a bit. Took Jan up to little workshop of printers again and took photo – think they thought we were mad. Went and had banana milkshake in square again. Walked down side street and bought biscuits and yoghurt. Back to milk stall where lots had gathered and sat till bus came. – little boy demanded his photo be taken. Lovely noise of goats bells as huge herd of black goats made their way along cliff path behind the cay shop. Stopped for shopping after dark and were shown around by an Iranian on a bicycle. 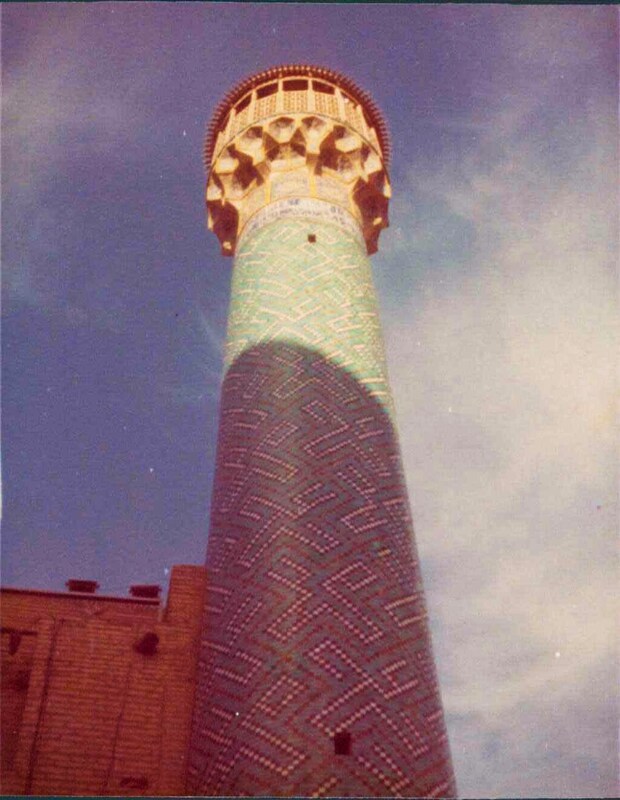 Went round Lady Mosque – blue tiled frontage like Shah Mosque, but inside was enclosed. Beautiful too (though not the charm of Shah Mosque). Then Sally, Fran and me headed for bazaar – lovely stalls of printed cloth, metalwork, jewels, inlaid boxes, ivory miniatures and silver boxes. Standing at one stall, a nice young Iranian came up to us and asked if we’d like to see some printing; so he led us out under an archway into a square and up some uneven steps to a little workshop where 3 blokes were sitting on the floor with bales spread in front of them. They were using 400 year old wooden printing blocks, placing them on cloth very accurately, and bashed them down with bits of leather strapped to their wrists. Bought lots of things in bazaar – two silver plated pill boxes with little pictures on, enamel earrings, enamel cigarette holder, mirror with shell picture on , two pieces of printed cloth. Wandered round local part of bazaar – cloth stalls etc – one stall selling rough wooden trunks and tuck boxes covered in furry material in bright red and secured with sticky tape with pepsi cola written on – amazing sight! 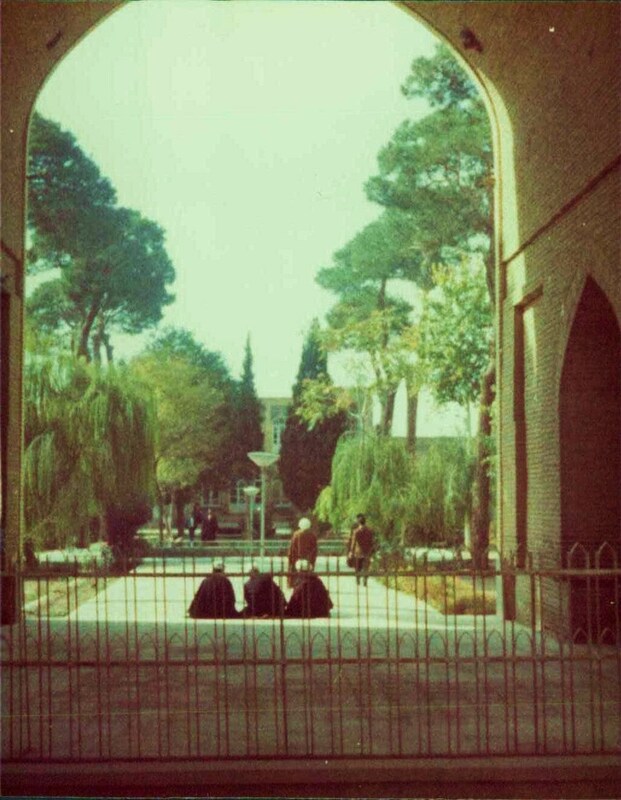 Found entrance to Islamic University – looked in through archway to gardens beyond – priests in long robes and turbans wandering in and out; not allowed in but took photo. Eventually got out of bazaar (much nicer than Istanbul, nicer things and less hassleing). Outside bazaar saw a real Biblical figure of old man with white beard, turban and flowing robe on a white horse riding into the bazaar – groped for camera but too late! Went and bought pickles and a kebab and tomato in huge flap of bread and ate it on lawn of the Maiden – met up with Heidi, Di and Pam (big). Little boys gathered and bicyclists stopped to watch us struggle with massive sandwiches. Started throwing stones. Jan turned up. All went for a cold banana milkshake and ice-cream! Jan went to Lady’s Mosque (Sheikh Lotfollah) while I headed for toilet of Shah Mosque. Man directed me there and then asked if I’d like to see upstairs. 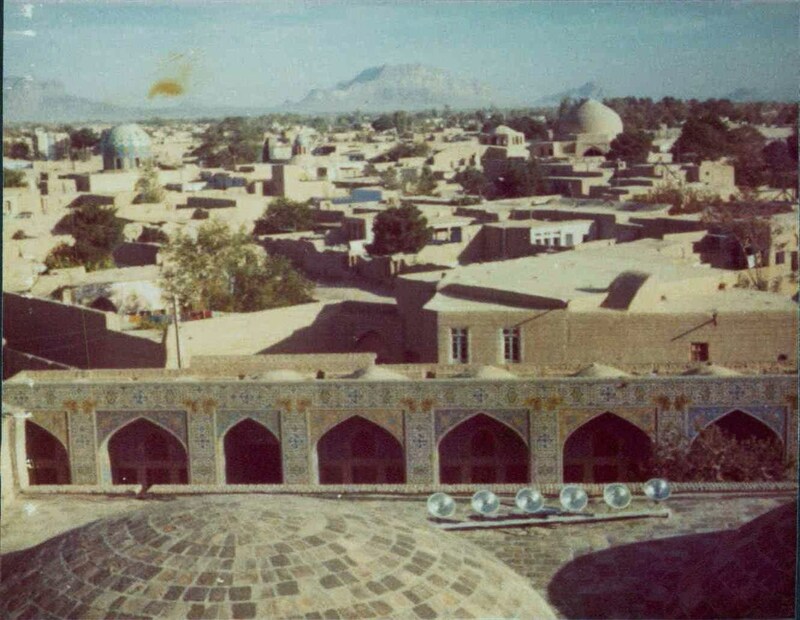 All very secretive – we lurked around post until no one there then he unbolted a little wooden door and went up dark stairs to the roof, then up further stairs to bottom of minarets – refused offer of going up further. Great views over town and mosque. He said not to tell because we weren’t supposed to go up! Met up with Jan – wandered down shops of square – bought salt and pepper holders on little silver-plated tray and little enamel cufflinks. Not a rial left! Met Chris and Nikki – gave up waiting for bus so hailed a taxi. 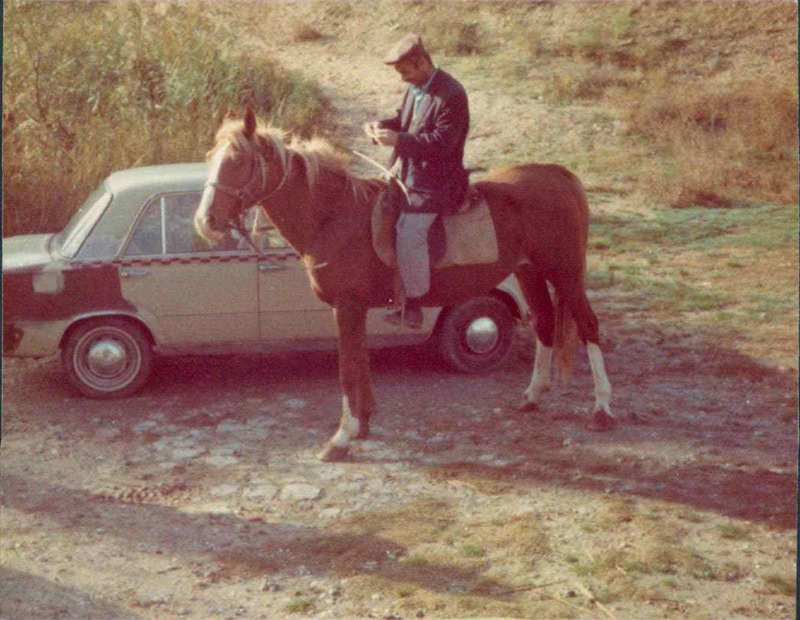 Dropped us in little back street – couldn’t quite remember where campsite was so wandered a bit; lots of veiled women. 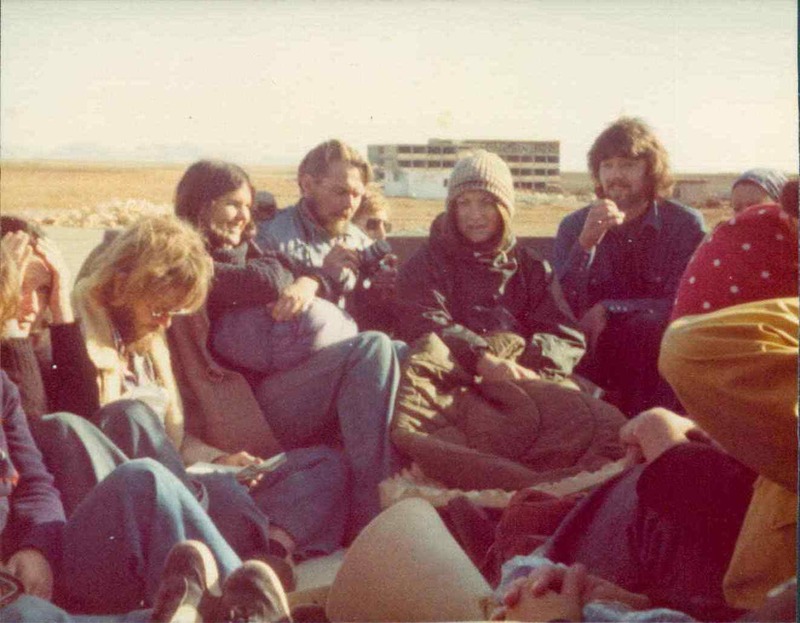 That evening went in again with Jan, Di, Heidi, Fran and Chris; all piled into taxi to Maiden Shah. Others wanting a taxi stopped one and car went into the back of it – stood there arguing, oblivious to passengers! Maiden Shah really beautiful at night – lamps all round square and domes of mosques floodlit and reflected in middle pool. Square very quiet and deserted. Walked up to Shah Mosque and saw illuminated front. Then made our way to the main street and walked about – various workshops still in action and a few shops too, but most of town seemed to be dead. Passed Shah Abbas Hotel – incredibly posh reception rooms and entrance – outside styled in arches almost like a mosque. (Others who went there were locked in for 2 hours refusing to pay extra for drinks! Police in etc). “Everyone feeling smelly and filthy (dust rises up through the floor from the roads – less in Iran – E. Turkey worst). 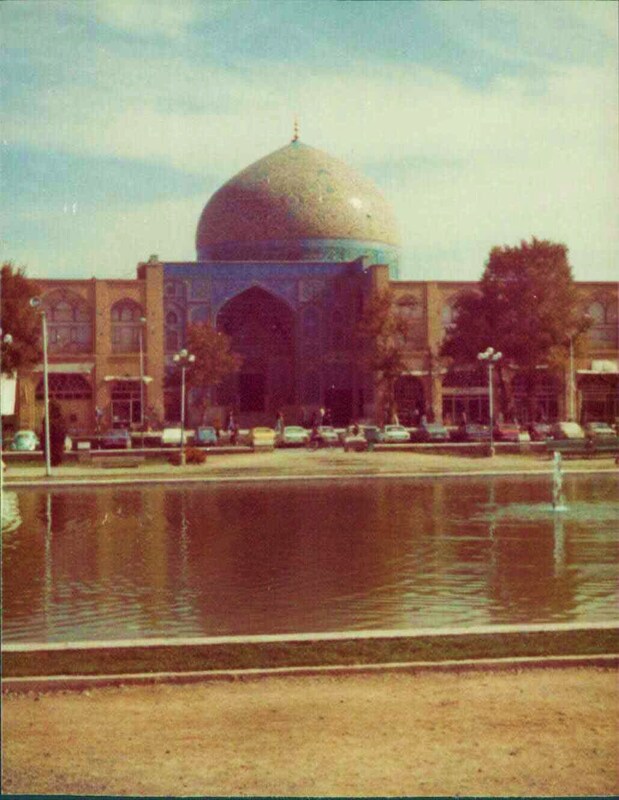 Got into Esfahan about 10.30. 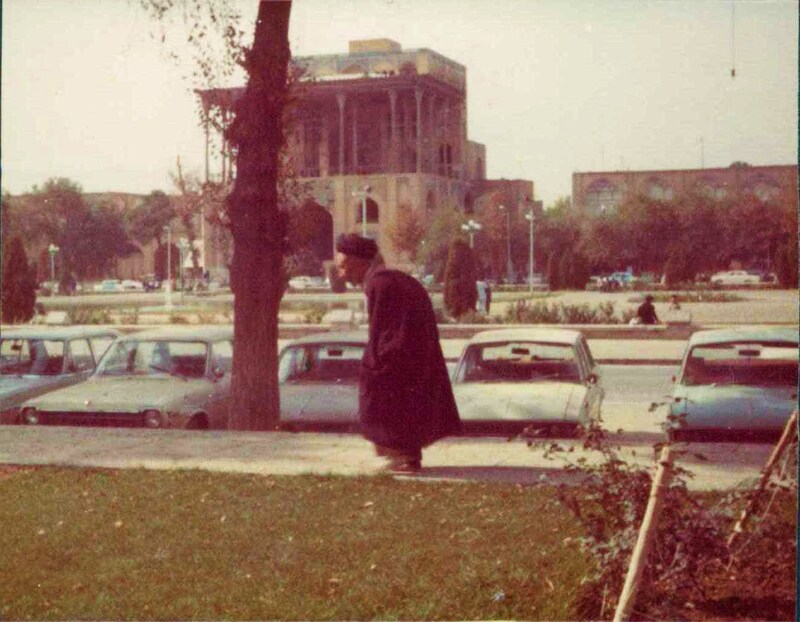 Drove up main boulevard – very wide street with rows of trees and paving down the centre with seats. 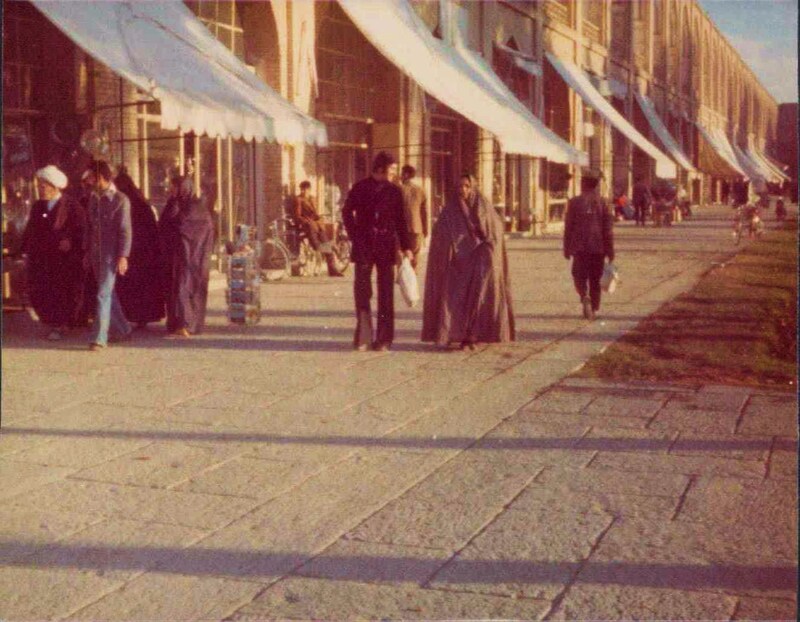 Dropped in Shah Square outside Shah Mosque [now called Imam Square and Mosque]. Really incredibly beautiful Mosque – covered in tiny, intricate blue tiles both outside and in. Passed through huge wooden doors, plated in silver with gold trimmings; passed under cool archways, again decorated in blue tiles. 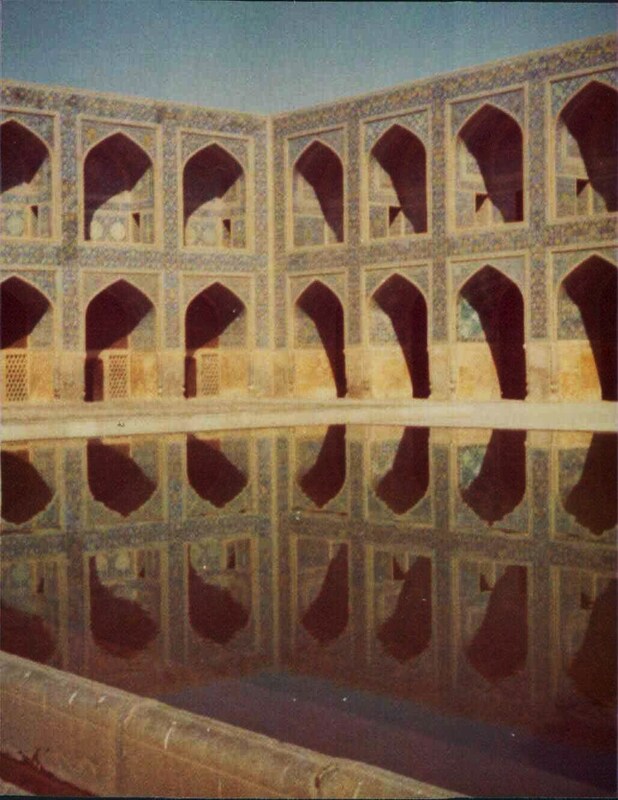 Main courtyard was huge and magnificent – arches and minarets and huge dome; some very delicate smaller arches in one corner (ten of them) and all were reflected in a rectangular pool, so 20 could be seen at once. Really warm in sun and peaceful inspite of a few tourists. Various little men squating under columns – one washing himself by the pool. Two little courtyards off from main one, either side of dome. One was fabulous. Rectangular in shape, enclosed with wide arches causing shaded raised pavements all round. Up the middle were trees and lovely white and purple flowers and at the centre was a little pool with goldfish. (Tiles here were blue but largely yellow too). Then there was the area under cover of the huge dome. At the centre the echo bounced back at you. Jan and I stood stamping on the stone floor. 2 Iranians asked us to pose with them! Then me, Jan and Rob made for main street and post office. Went down arcade with fantastic shops with material prints, miniatures, jewellery, silverware etc. Asked way from lad who gave us dry figs and pointed us in right direction. Looked for place to eat through arch, down steps to small courtyard with store houses and restaurant. Ordered chicken and rice; served up with chunks of raw onion and flat bread (loads of it) and yoghurt, glasses of water and loads of ice. Sprinkled kind of nutmeg (sweet) on rice – delicious. Really filling meal for 90 rials (less than 90p). Staggered across street into sticky cake shop! Biggest we’d seen – rushed from huge cakes to date biscuits wondering what to buy! Bought 3 different types – cocoanut cake, chocolate covered bun and date biscuits. Felt too full. Rob stopped on way back to square to have shoe mended – Jan and I escaped man wanting us to buy his sticky cakes (!) then a carpetseller who wanted us to drink his cay! Met up with others coming out of bazaar. Had a fresh banana milkshake at stall in square – saw it being made. Then me, Julie and Paul wandered up street, beckoned into miniature shop by artist. He did little drawings on his name card and wrote our names in Farsi. Showed us lots of photos of girls who’d come into his shop and were now all his girlfriends! 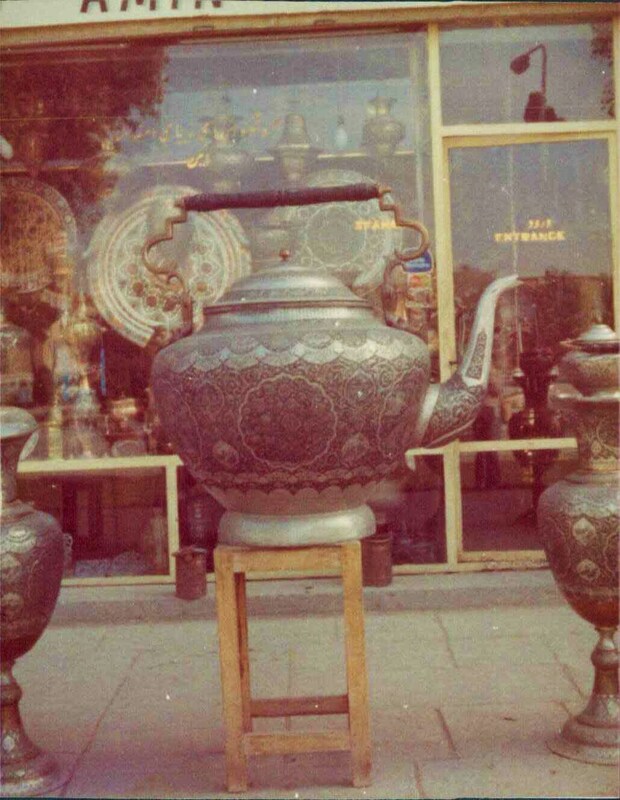 Outside one shop, where a metalworker was banging away at a plate inside, was an incredibly big teapot – made Balnagown teapot [of Edinburgh Gorrie Granny] look doll’s size! Back to camp after post office stop – 6 letters!! Had a shower (cold), washed clothes etc. “Lovely sunrise. Lots of kids came to watch us with great amusement. 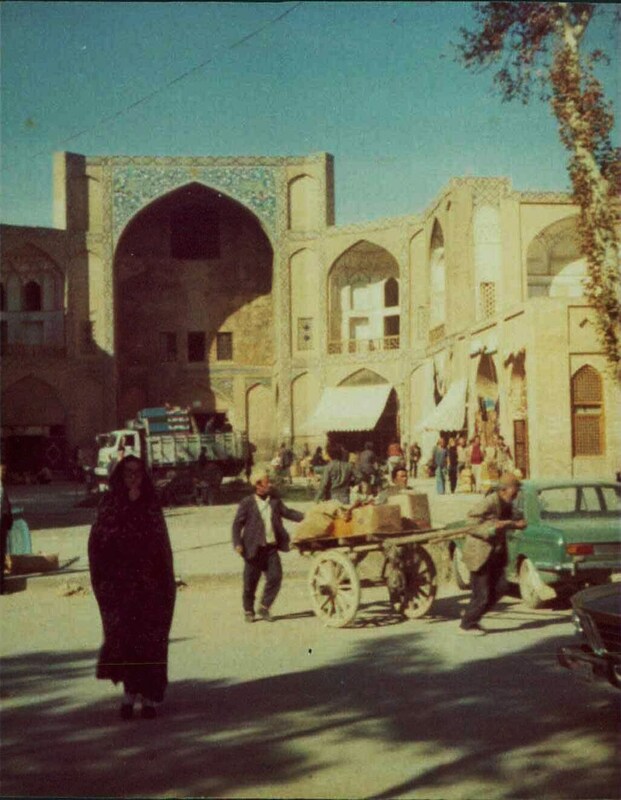 Shopping stop at Hamadan – oldest city in Iran. Lots of bananas! Wandered round market with Sally, Fran and Adrian. Saw them making kidney kebabs; bought little buns. Looked in ceramic shop – lovely cups and jugs. Afternoon stop at Arak. Newspaper bought – Carter President of U.S. – first news for weeks! Incredible amount of western shops. Went into one that sold peanut butter – about £1 for tiny jar. All products were British and foreign, like being back in Britain – even had Coleman’s Mustard! Stopped at sunset by the road to have supper before driving on. Sat at front seat changing tapes while everyone else slept. Cay stop at bus terminus to Tehran – not very nice, but cafe was warm and pleasant. Second stop at row of shops open late – bought nuts and nougat. People watching telly in big cay/restaurant place. 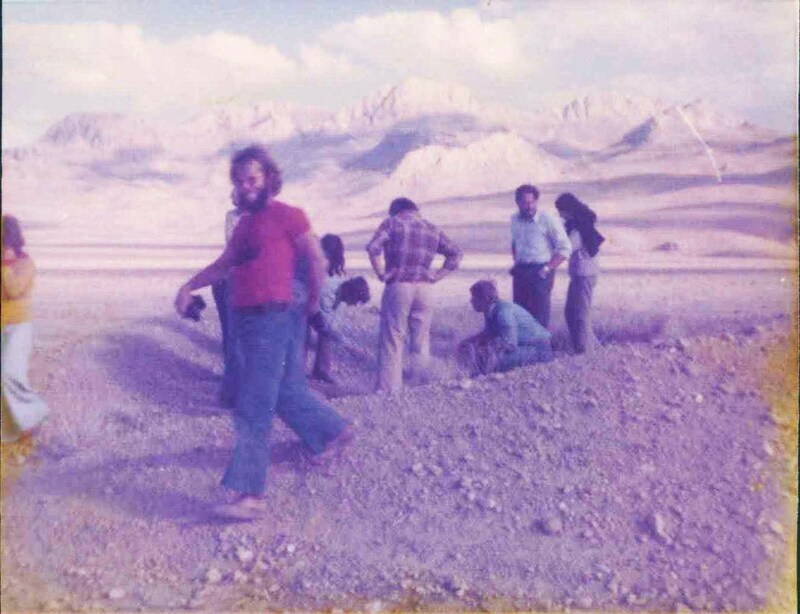 Iran is often portrayed negatively in the news these days, so it is strange to re-read the first impressions of my 18 year-old self, this time 36 year ago – curious, excited, naive and glad to be there. “Breakfast outside customs house, to amusement of lorry drivers. Iran! Small villages below hills – the hills and plains are very light in colour. 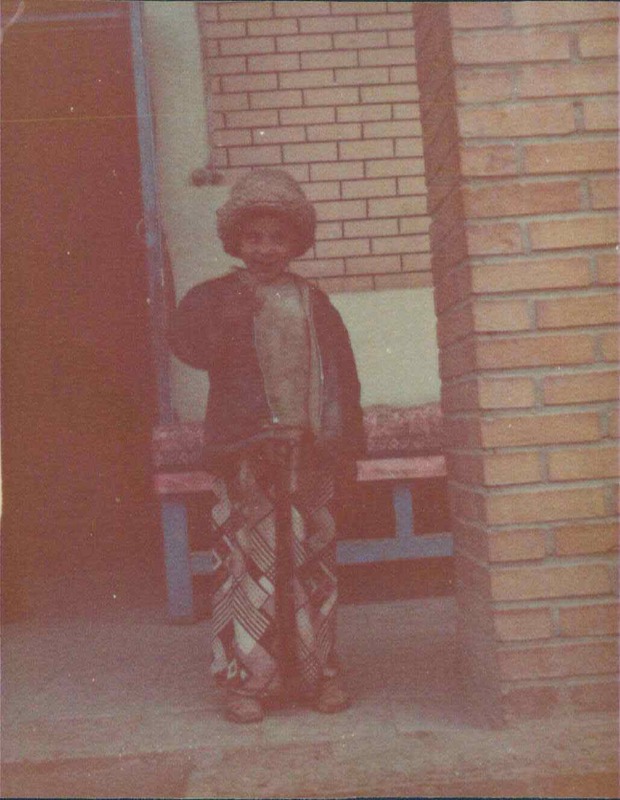 Dress is different – men with jumpsuits and boots and striking turbans. Women with veils down to the ground, very light floaty material, often with jeans on underneath! People curious not pressing like Turks. Lunch was flat waffery bread and tomato – bread a bit like cardboard. Stopped later in smaller town for few minutes – nice biscuits and cakes and lots of nuts. More picturesque costumes – people friendly. Little boy saluted me as I got into bus! Camped by river as sun going down – lovely orange sky, and pink in east. Herds of sheep and goats. 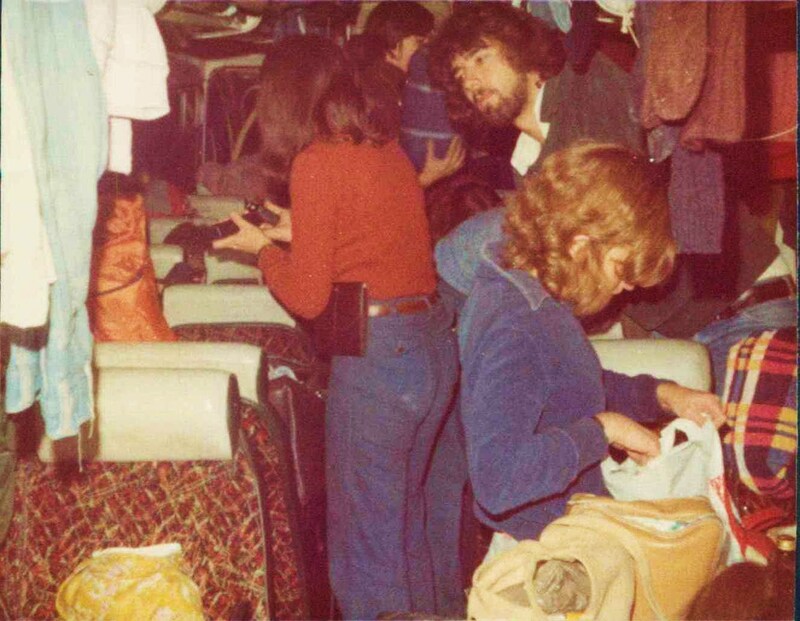 Iranians came and looked round bus – perhaps looking for drugs. Stood around while we ate.